An ancient pear tree due to be chopped down to make way for the HS2 high-speed rail line has been voted the best tree in England. 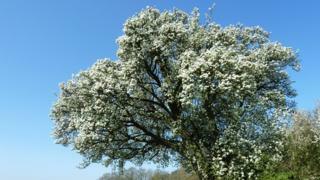 The Cubbington pear tree is believed to have been growing near the Warwickshire village for more than 250 years. The Woodland Trust, which ran the Tree of the Year poll, has called for it to be preserved due to its age. HS2 officials say the tree's hollow trunk means it will have to be felled, with seedlings planted nearby. The proposed high-speed line will link London with Birmingham, but has attracted criticism due to its cost and planned route through areas of countryside. Peter Delow, chairman of the Cubbington Stop HS2 Action Group, nominated the tree for the award, and said the win sent "a clear message" to politicians to conserve the country's natural heritage. "Those who voted for our tree clearly care about the protection of our natural environment," he said. "It would be perfectly possible to build HS2 without destroying our tree and many others." Cubbington's pear tree was selected after attracting more than a third of 10,000 votes for the best tree in England, beating nine other finalists to the title. Runners-up included the Tolpuddle Martyrs tree in Dorset, Glastonbury's Holy Thorn and the Boscobel Oak in Shropshire, a descendant of the tree where the future King Charles II hid after the final battle of the English Civil War. Beccy Speight, chief executive of the Woodland Trust, said public affection for the Cubbington pear tree - one of 20 within the construction boundaries of HS2's first phase - showed the importance of the natural world to the country. "Sadly many iconic trees do not have the levels of protection they deserve," she said. Ben Ruse, a spokesman for HS2, said younger trees would be planted in the area surrounding Cubbington to offset the loss of the historic pear tree. "We have always recognised the significance of the tree and will do all we can to ensure that wild pear trees continue to be a feature of the countryside around Cubbington," he said.